When you’re heading into the office you obviously need to look sharp. You can’t very well wear dirty tennis shoes with your pressed suit or business casual outfit, can you? That’s why it is important to have a good pair of men’s dress shoes. However, not all men’s dress shoes are created equally. 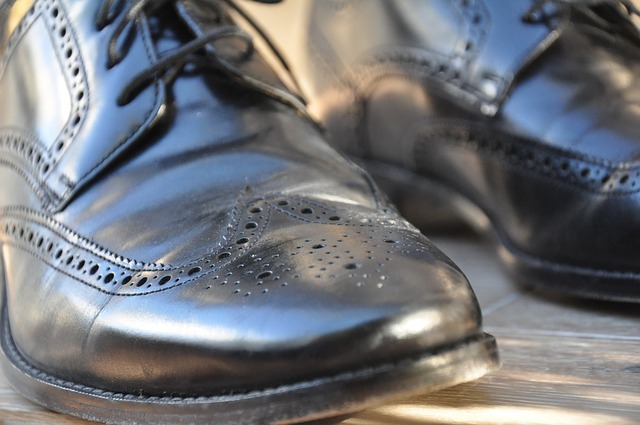 Prices and styles of men’s dress shoes range, but one thing you want to be sure is that you have a comfortable pair of men’s dress shoes. That is because you’re in these shoes at least 8 or 9 hours a day and even if you have a desk job, you’ll be on your feet for some of the day walking to and from meetings, the breakroom, the printer, etc. You might worry about choosing the right pair of dress shoes because there are so many options available. There are hundreds of brands and each of those feature different models of shoes that come in different colors, sizes, and widths. Thankfully, we’ve done the work for you. After scrolling through the internet, reading reviews and doing hours and hours of research, we’ve determined the best 8 men’s dress shoes for comfort. If you are looking for a high quality pair of men’s dress shoes that are also comfortable, Clarks is likely the brand for you. Clarks has been making shoes since 1825 and they’ve really perfected the dress shoe. For those looking for the best slip on men’s dress shoes, the CLARKS Men’s Escalade Step Slip-On Loafer is hard to beat. These dress shoes are both durable and flexible with a stylish look. You can choose between black and brown, but these slip of loafers aren’t just nice to look at—they’re also extremely well made. The CLARKS Men’s Escalade Step Slip-On Loafer features a sleek leather upper but combines materials to give you the most comfortable fit. The insole if Ortholite foam so you can rest assured that your foot will be cushioned with every step. Plus, the insole can actually be removed to make it easy to clean or insert your own custom orthotics. What’s great about the CLARKS Men’s Escalade Step Slip-On Loafer is that it combines comfort and style. No matter if you’re heading out for a night on the town or dressed to impress some investors at work, the CLARKS Men’s Escalade Step Slip-On Loafer is one of the most comfortable men’s dress shoes on the market today. If Clarks is the first brand that comes to mind when you think of men’s dress shoes, ECCO is often quick to follow on that list. Although newer to the industry, ECCO has consistently delivered quality shoes, and the ECCO Men’s New Jersey Lace Oxfords are no exception. These comfortable dress shoes for men come in a variety of colors so and are made of a full-grain leather. With detailed stitching and a stacked heel, you’ll be dressed to impress in the ECCO Men’s New Jersey Lace Oxfords. In addition to being stylish, the ECCO Men’s New Jersey Lace Oxfords are also well built and extremely comfortable. Not only do these dress shoes come with a moisture wicking insole, but they also feature a padded collar for constant comfort. The insole is also great for keeping your feet dry and climate controlled to avoid uncomfortable wetness. Plus, the polyurethane provides great traction no matter the surface. 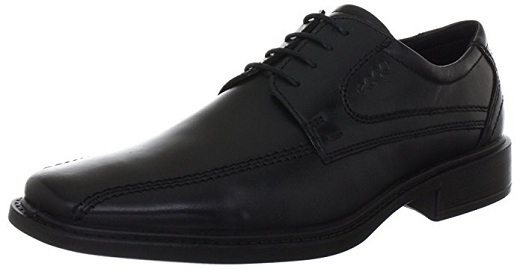 If you are looking for a great pair of comfortable men’s dress shoes, the ECCO Men’s New Jersey Lace Oxfords should certainly be on your list to consider. 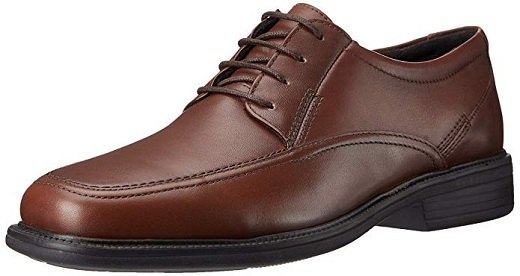 If you are looking for a high quality pair of men’s dress shoes that are also comfortable, the Clarks Men’s Tilden Cap Oxford Shoe is a great option. These are extremely high-quality dress shoes, but they’re also stylish and will leave anyone you encounter during the day highly impressed. Plus, the Clarks Men’s Tilden Cap Oxford Shoe is built to last. Clarks are typically more expensive, but you won’t be replacing them after just a year or two of wear. The Clarks Men’s Tilden Cap Oxford Shoe features a one inch heel shaft with quality arch support. They’re lace up so you are guaranteed a secure fit and the rubber sole means you have good traction on almost all types of surfaces. These shoes also have flexible outsoles, which provides more comfort. In addition, these Clarks also have a fabric inner lining, which means your feet are always comfortable. The lining is also moisture wicking, so your feet stay dry. Coming in tan, black and brown, the Clarks Men’s Tilden Cap Oxford Shoe is certainly one of the most comfortable men’s dress shoes. Hush Puppies is another name that stands for quality in the men’s dress shoe game. 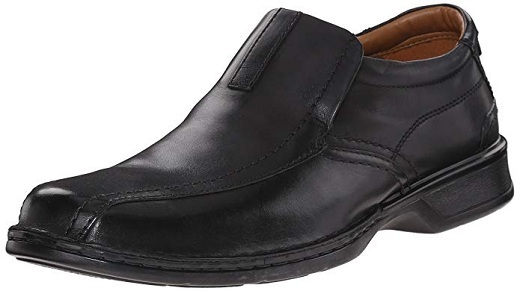 In fact, the Hush Puppies Men’s Rainmaker Slip-On Loafer is one of the most comfortable men’s dress shoes on the market, especially for those wanting a slip on loafer option. What’s great about the Hush Puppies Men’s Rainmaker Slip-On Loafer is that it can stand up to the weather elements. The stylish shoe features a leather upper that is waterproof and the seams are all sealed to keep water out and allow your feet to stay dry. In addition to standing up to the elements, the Hush Puppies Men’s Rainmaker Slip-On Loafer also have ZeroG technology, which means they’re lightweight without sacrificing durability and quality. The tongue and collar are lined with comfortable fabric to provide an enhanced level of comfort. Plus, the ethyl-vinyl foot bed is removable so you can easily clean it or insert your own orthotics. 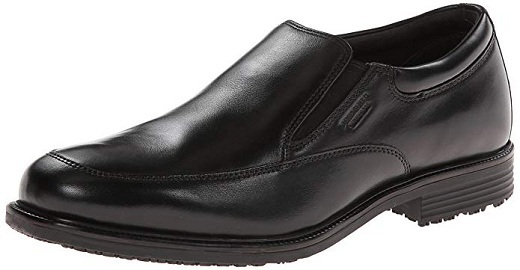 With great arch support and maximum comfort, the Hush Puppies Men’s Rainmaker Slip-On Loafer is a shoe to consider on your search for the most comfortable men’s dress shoes. Another quality option for a comfortable men’s dress shoe is the ECCO Men’s Helsinki Slip-On Loafer. This dress shoe is great for both casual and business wear and comes in three different colors. What’s great about the ECCO Men’s Helsinki Slip-On Loafer is that it features a sleek leather upper and Danish design that truly makes it stand out. The textile lining with moisture wicking capabilities is able to keep your feet comfortable, cool, and dry. In addition to the features listed above, the ECCO Men’s Helsinki Slip-On Loafer also has a shock absorbent sole that adds another layer of comfort. Plus, the ECCO Comfort Fibre System adds breathability to regulate the temperature inside the shoe. The ECCO Men’s Helsinki Slip-On Loafer also has a removable insole so if you need to insert your own custom orthotics, the process is simple and easy. If you need a comfortable pair of men’s dress shoes, the ECCO Men’s Helsinki Slip-On Loafer is a great option. The Bostonian Men’s Ipswich Lace-Up Oxford Shoe is another great choice if you need a comfortable men’s dress shoe. This lace up shoe comes with a full grain leather upper that also offers breathability to keep your feet cool and dry during the work day. Plus, the ethyl-vinyl acetate outsole is able to provide cushioning and shock absorption while also giving you great traction. The inside of the Bostonian Men’s Ipswich Lace-Up Oxford Shoe is also built with comfort in mind. You will find flexlite foam cushioning throughout and the shoe also features a padded tongue and collar so you won’t need to worry about rubbing and pinching. With foam between the upper and sock lining, you’ll also get an added layer of comfort. Plus, the removable insole enables you to insert your own custom orthotics if needed. Simply put, the Bostonian Men’s Ipswich Lace-Up Oxford Shoe is one of the top most comfortable men’s dress shoes. Dockers is another brand name that signifies quality when it comes to men’s dress shoes. The Dockers Men’s Endow Leather Oxford Dress Shoe certainly keeps with that notion. These stylish lace up men’s dress shoes come with a sleek leather upper that gives you a polished, sophisticated look. They’re also available in both black and brown so you can choose the option that matches your wardrobe best—or get both! In addition, the Dockers Men’s Endow Leather Oxford Dress Shoe is also comfortable. Part of that is due to the fact that the shoe features an EVA sock liner and a square toe box to provide more room for those with wider feet. The lace-up closure provides a secure, snug fit, while the padded foot bed adds more comfort. Plus, the sure-grip outsole offers traction no matter where you are. If you are looking for a quality pair of stylish and comfortable men’s dress shoes, the Dockers Men’s Endow Leather Oxford Dress Shoe delivers. Last but not least, the Stacy Adams Men’s Dunbar Wingtip Lace-Up Oxford is another solid option for a comfortable men’s dress shoe. Not only do these two tone shoes come in tan, black, and navy, they are also extremely well made. These wing tip men’s dress shoes feature perforated brogue detailing and a polished leather look that is sure to make you stand out. Not only is the Stacy Adams Men’s Dunbar Wingtip Lace-Up Oxford stylish, but it’s also comfortable. The leather lining provides a fit unique to your foot, while the cushioned foot bed adds another element of comfort. The lightweight shoes also feature a stacked heel and adequate arch support to keep your foot well supported and comfortable during even the longest of days. 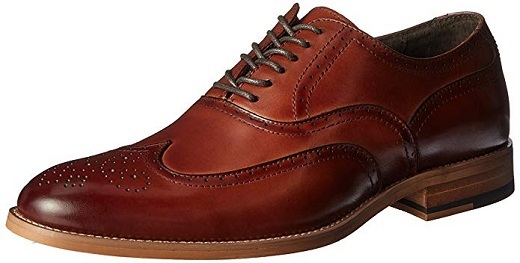 If you are looking for a great pair of stylish men’s dress shoes that don’t lack comfort, the Stacy Adams Men’s Dunbar Wingtip Lace-Up Oxford is definitely a shoe that you should consider during the expansive search process. Are you looking for unique, stylish men’s dress shoes that you can wear for any occasion? Then the Nunn Bush Men’s Nelson Wingtip Oxford is the perfect match for you. Made of 100%-real leather, Nunn Bush is the type of shoes every man should own. It comes with a synthetic sole that does not skid on slippery surfaces. Furthermore, it consists of an energy rebounding gel footbed and cushion in the heel area that acts as a shock absorber. What’s more amazing is that these shoes can be worn for dressing up or down. It is designed to blend with any type of clothing, ranging from dress pants to jeans, thanks to its neat, polished look. Moreover, it comes with longwearing outsoles that can withstand any type of weather. As the name suggests, the Rockport men’s waterproof lead the pack slip-on loafer is a featherweight, flexible shoe, designed to withstand harsh conditions with every step. Its hydro-shield waterproof construction not only repels, but also prevents the buildup of moisture inside the shoe. The fact that the shoe is lightweight does not at all compromise on its functionality and durability. In fact, this minimizes on foot fatigue, ensuring that you enjoy maximum comfort in your new stylish look. Additionally, this slip-on loafer is constructed using genuine leather, for enhanced durability. It also comes with a synthetic sole, mesh lining and a seam-sealed upper to ensure superior traction, flexibility and comfort throughout the day. Amazingly, the Rockport shoes can pass as sneakers and still function as formal, business wear. Furthermore, they blend well with any type of clothing, ranging from suits to casual wear.